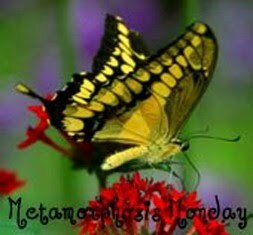 Welcome to the 149th Metamorphosis Monday! Greetings! How was your Thanksgiving? I hope it was wonderful and you got to spend lots of time with family. I drove 8 hours to Ohio to visit with my son and daughter-in-love-to-be. I miss them and cherish the time we get to spend together. I snapped this pic of a house near by. I loved this particular photo because you can clearly see the American flag waving out front. For this Metamorphosis Monday, I’m sharing a few “small” Before and Afters–nothing earth shattering, just “stuff” I worked on today and a few random things I noticed while working outside. My decks were covered in leaves. I had already discarded one of my potted tomato plants and it was definitely time to pull out the other one. The geraniums are still blooming. It was so nice and warm here today…perfect weather for working on the deck. The other end of my messy, leaf covered deck. So here’s my after…not too exciting but definitely looks better. I also brought a lit tree out. Do you see it there on the right inside the porch? A few months ago I blogged HERE about finding a squirrel INSIDE the screened-in porch, happily pigging out on the bird feeder I had brought in the night before. Both screen doors was closed and latched so I couldn’t figure out how he got in. I looked at all the screens and couldn’t find any holes. Today, as I was blowing leaves off the decks and trying to clean out the leaves that get trapped between the screening and rails, I noticed some small punctures in a screen. Fortunately, the screens are removable. I remember my contractor/builder showing me how easy it would be to remove one to take it in to have it “re-screened” if one ever got damaged. Time to put that to the test. I should cut some of the blooms and bring them in to float them in a bowl, like I did HERE. We have a cold front headed our way and these beautiful blooms will unfortunately be toast in another day or two. Besides my wee deck metamorphosis, I have another little “Before and After” to share today. Last year I had the pleasure of touring the Southern Living Idea House in Senoia, Georgia. The Christmas decorations were amazing. You may remember this beautiful mantel I shared HERE right after I took the tour. Note the bee pillow on the sofa. Does it look familiar? Yep, it’s the same one I have in my home office/studio. I totally didn’t remember that pillow being in the idea house until I searched back for a picture of the mantel for this post. Too funny. Here’s a close up of the mantel when I visited the Idea House. I could tell the mantel was a bit past its prime, but it was still beautiful. Beth from Unskinny Boppy recently alerted me to a photo at Southern Living online showing this mantel in its earlier days when it was still fresh. So this is sort of a reverse Metamorphosis. Here’s the pic I shared of the mantel late in the holiday season. And here’s how it looked when it was newly finished and a bit more lush. Gorgeous! When I posted about it previously, HERE we all spent a good deal of time trying to figure out what plants/greenery had been used to complete it. 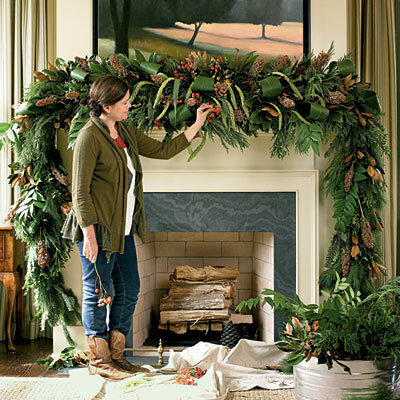 You can read more about what was used to create this beautiful mantel, and get tips on how to create it at Southern Living online. Looking forward to all the “Before and Afters” for this Met Monday! Thanx for hosting! Hope your Thanksgiving was fabulous! As always -thanks for hosting Susan. I love this mantle – I was thinking of doing one like it downstairs this year so I'll have to check out Southern Living's link! It's truly a busy time of year! With all the preparations from one holiday to another. Adored the story of your squirrel!!! We watch them in our backyard as they empty our birdfeeders!Ha! Your tree is luminous through the screen…I'll be back when you are ready for its reveal! I love how the whole house is decorated in Christmas lights. Boy was that squirrel clever. I'm surprised he chewed through the screening. Good thing you know how to fix it. Your Debutante camellias are stunning flowers!!! Thanks for hosting. Hope you had a great Thanksgiving. I love the lush natural look of that mantel – Gorgeous! Your deck looks terrific! I really need to get out and clear off ours before the snow starts flying in ernest. Thanks for sharing and for hosting this party each week. Hi Susan! Glad you were able to be with your son and future daughter in law for Thanksgiving! That house looks so pretty ans sparkly!! Susan that Mantle is beautiful, I don't have a Mantle but I have a buffet to decorate like a mantle this year…I'm real excited about that. Thanks for hosting another Met Monday. Thanks for hosting! You Camillia is stunning! You must really enjoy it. Love the mantel. I didn't realize that the one in this Dec. issue of SL is the one you showed us last year until you pointed it out. Hi Susan, I LOVE that SL mantel as well. It's amazing. Thank you so much for hosting the lovely party. Thank you for hosting and having me at this MM, as I'm all decked up, so it is a hard working metamorphosis, even though I haven't posted my entire house, but the breakfast room table and buffet. Congrats on the winner. I'm so glad you had a great Thanksgiving with your dear son and his girl friend. Lots of hugs. I do remember that gorgeous mantle. A real show stopper! Glad you had a good Thanksgiving with your son. Wishing you the very best of this season. Glad you had a great Thanksgiving! Thanks for hosting!! Susan you always take such fantastic photos. I'm interested in the Christmas outside lights photo you took here. I'm wondering what settings you use? Did you use a tripod? It seems when I try to take night photos they are always blurry. Yours is so clear and sharp. Any suggestions for me? 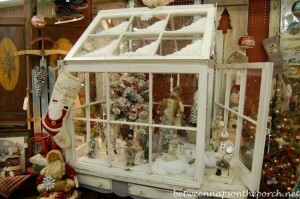 Susan, I just love the Southern Living house! I also visited it at Christmas! It was great! Thanks for such a great reminder. Thank you for hosting an awesome link party! I love your blog and seeing the other blogger's great ideas! 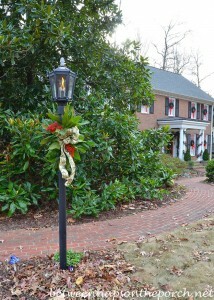 Did you know they are doing another Southern Living home in Senoia? They have moved a historic cottage in to restore across the street form the original home. We also drove to Ohio (7 1/2 hrs for us)…so happy the weather cooperated!! Joining your party again…thanks for hosting! Sandy, thanks! I took that photo from inside my car and just braced my arm on the back of the passenger seat. The camera I am using (Nikon d5100) is supposed to be especially good in low lighting. I just bought it this week and I've just started experimenting with it. That's the first outdoor nighttime pic I've taken. The camera you're using makes all the difference in the world. The newer cameras are a lot better in low-lighting situations. I do recommend using a tripod when you can. If you can't, brace your arm/hand on something because any movement in low lighting will definitely blur the picture. Hope this helps. Thanks so much, Betsy. Yes, I had heard that…sooo exciting! I can't wait to see what they do with the home. So glad they are saving the older homes. Hi Susan, I'm glad you had a nice time in OH. You probably know this b/c it's kind of common sense, but some people don't, so I thought I would mention it…if you move your geraniums (and other plants to the garage for winter and keep them even (slightly) watered, they will live through winter. Was at the beach for Thanksgiving, and noticed our live oaks there had small acorns with caps. Maybe it depends on the type of oak? I was wondering if you were going to show us duct (sp?) tape over that screen? ;o) Have a good week! Enjoy your new camera. Doesn't it feel good to look out the window and see a tidy deck? Little work, big difference… my favorite. Oh, not to be picky, but it's spelled mantle. Yep, does feel good. Probably won't last long though…more leaves to come. Here in Atlanta I figure I have leaves from every tree on the street in our gutters and on our deck. Glad you and son could be together this Thanksgiving. Family is wonderful. That mantle is breathtaking. Happy MM! So excited to be a part of the party. Thanks so much for sharing the mantle…I couldn't remember where I had seen it before but wanted to see the instructions again 'cause I really do love it. I have access to all that type greenery just for the cutting so I'm hoping that will be my holiday mantle this year. I dream of a garland like that for my mantel. Maybe with earlier planning I can pull it off next year. I am in the Atlanta area also, so was wondering if you leave your bottle tree out all year? I am going to start one next year. Susan, what a great "squirrel story"…LOL! Thanks for hosting this great party each week! Glad to link up! I remember that posting from last year and that mantel! It was amazing! Mr. squirrel and me would be having a date!! Two go out and only one comes back ya know!! LOL… they are stinkers aren't they! He didn't waste anytime after you left!! I can't believe you have a Camelia blooming! What a nice treat! We have a light casting of snow up here today. I'm a little jealous you still have flowers around. Your camilla bush/tree is beautiful! First, thanks for hosting :). 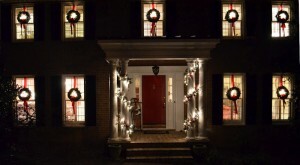 Second, we have houses on our street that took advantage of the warmer Ohio temps this weekend to put up lights. I am glad you enjoyed your time here in the great Buckeye State! Hey, thanks for the shout-out! 🙂 I am pretty obsessed with fresh garland and wreaths this year in my decorating so I linked up how I transformed an old standard wreath into something totally new with a few clippings from my yard! It sounds like you are a busy, busy lady, my friend! I'm so glad that you were able to spend the Thanksgiving holiday with your son and daughter in-law-to-be. Thanks so much for sharing all the wonderful photos with us! 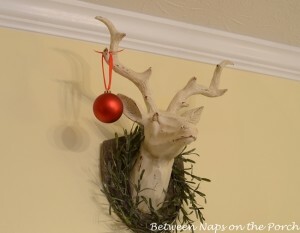 Love, love, LOVE that Christmas mantel…it's absolutely gorgeous! And…thank you for hosting another Met Monday for us, dear friend! I'm getting in on the party a bit late…but better late than never! Hehe! Beautiful that house all lit up …..
Good start of the week …. Darn squirrels! Hope you were able to fix your screen. Thanks for hosting the party. Squirrels are an attractive nuisance. I love to watch them play on the trees and the back fence, but they can really do some damage. Glad you had a wonderful holiday and a safe trip home. I love your blog; your tablescapes are incredible! Thank you for inspiring me to consider how I am adorning my table and not just what I'm serving! Happy Tday to you! bet ya won't be leaving the bird feeder on the porch anymore. Oh yes, I was doing some sweeping on a messy patio this weekend as well. No tunneling squirrels, tho, thank goodness! Love that camelia you have, who knew they bloomed this late in the year! Susan I wanted to comment on replacing your screens. I have a screened in porch that my cats use a lot and I had them use a specific type of screen material which is "pet proof or pet resistant". Lowe's sells it but a reliable screener should know about it. It would solve your squirrel problem. Search for it on the internet…it works!